Food: Larry will BBQ the meat. Feel free to bring other food (salads, desserts, chips, etc.). We will need a new cook in the future. Larry would like to train someone for the next BBQ. If you are at all interested, please come early to help and be trained by Larry. Activity: turning tops, we provide wood. Bring: a tool & safety glasses. Bring wood and tools for the raffle (don't leave unraffled items). On Highway 85 North or South, watch for signs for West Valley College. Take Saratoga Avenue west to the third stoplight (Fruitvale). 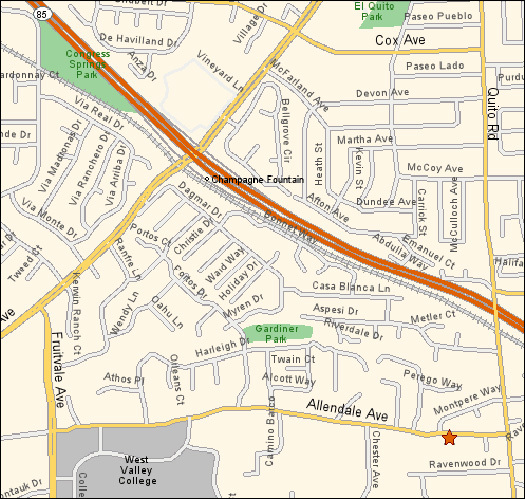 After turning left at Fruitvale, take another left at the next light onto Allendale Avenue. Allendale winds past the parking lots of the college, and then dips down a small hill. As you start up the other side of the hill, Jim's house, 18582 Allendale, is on the right. Park in the neighbor's circular drive on the left of Jim's drive. Do not park in either of the neighbor's secondary driveways. We need a volunteer - parking coordinator/director. 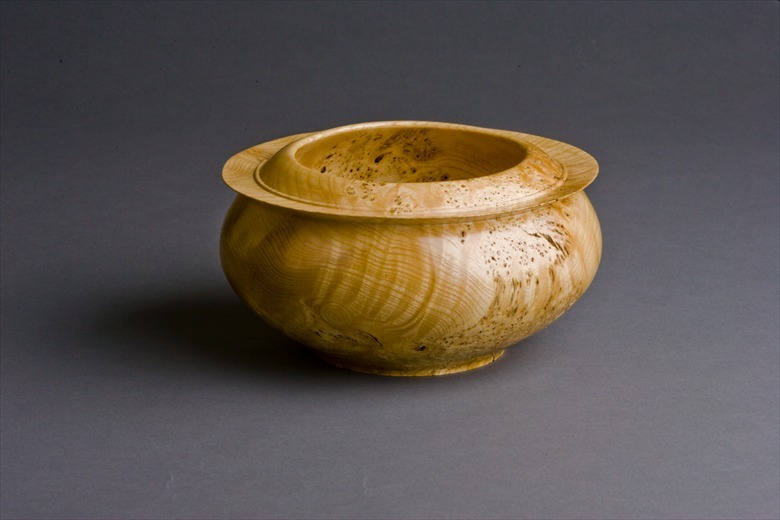 John Sauer and Glenn Krueg showed awe inspring examples of their woodturnings. Glenn showed examples of the small pieces he likes to turn with a discussion of how to turn them. John displayed a number of prize pieces. These are of the category: don't touch unless you are wlling to buy.His specialty is ornamental turning. The President's Challenge was Collaborative turning. See pictoral results here. We are all members of this club for various reasons. Usually it is to learn more about woodturning and perhaps make some new friends at the same time. Meeting monthly is great, but who wants to wait a month to learn something new or make some progress on a current project. Many of us reach out to other club members for suggestions and feedback through the Yahoo Group Email. This is a great way to get fast information and directions from many of the members. This might also lead to visiting someone else's shop which is often worth the road trip. Maybe someone will show you a tool or piece of equipment you are considering buying or even teach you a technique you were interested in learning. Often, when I visit someone’s shop, I start to look around to see how its laid out and find all sorts of tools, widgets and jigs and homemade ideas that we all come up with out of necessity and creativity. This is often the best learning experiences from the visit. I remember visiting Barry Udens shop and saw a piece of pinkish poster board attached to a stick. It was laying real close to the lathe so it must get used. Looked like a miniature protestors sign, but no writing on it. Nothing one would ever see in a catalog. What the heck is that for? It's for placing behind the turning so you can more clearly see the shape/form without all the distractions of the tools and junk in the background. This is the kind of often simple (and often complex) thing you see and pick up when you get out of your own shop and visit someone else's shop. It's little unanticipated gems like this that make the trip interesting and fun. So, reach out to other club members, make some new friends, help someone out who is learning and take a road trip and see how others are doing things. You never know what you might learn. (and of course, expect to discover that there is some new tool or widget that's gonna cost you …) Maybe one day I will actually get around to making my little protestors sign. A new publication called "More Woodturning" is being born. It will be on the scene as a monthly on-line magazine. They have offered a promotion to us. In return for putting a link to their magazine on our website, we will get a monthly article for this newsletter. We will give it a try, hopefully next month. 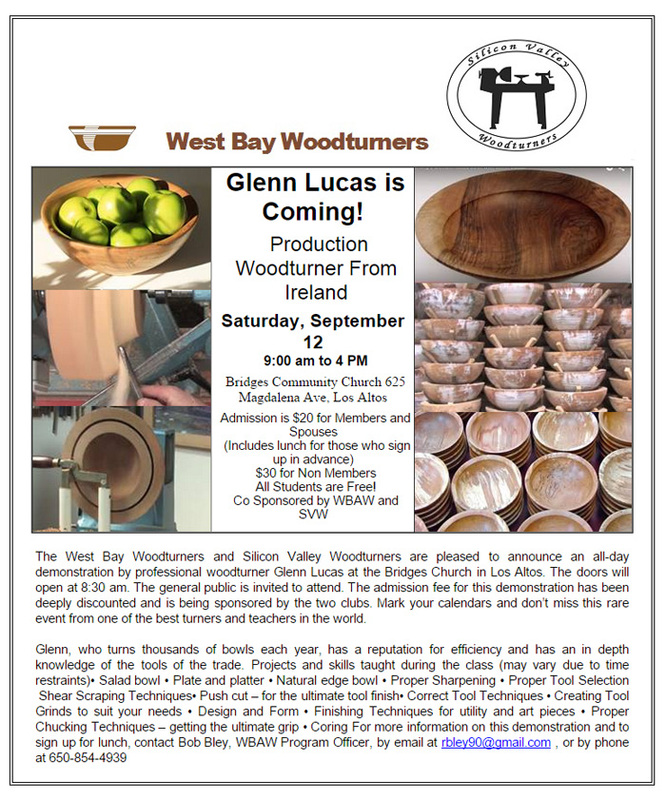 Meanwhile, go to the website, click links, click on the "More Woodturning" logo and take a look at sample articles. If you subscribe, it will cost you, of course. Let me know what you think.